This month's Games For Windows Co-Op Night takes us into the vast reaches of the galaxy in Sins of a Solar Empire, a real time strategy game from Iron Clad games. We'll be playing on Tuesday, June 30th at 8PM Eastern. To join up we suggest joining our Steam group and utilizing the chat room to find players to meet up with. We have a game going in the channel: Co-Optimus with a password of coopnight. Other people area available in our steam chat. Choose from a wide range of scenarios to complete. Each scenario ranges in size and the number of players it supports. Players can work together to conquer enemy AI, utilizing interface tools for communication and collaboration. Ten millennia have passed since you and the few survivors of the once mighty Vasari Empire fled from an unknown threat that all but exterminated your kind. You now find yourself at the fringe of the galaxy in a sector occupied by a pathetically primitive species - one obsessed with trade and lacking any central organization or military technology. Calling themselves the Trader Emergency Coalition, they would have been ideal slaves in the glorious days of the past, but time is of the essence. Use your mastery of phase-space manipulation, gravity and nanotechnology to quickly eliminate any local resistance and acquire the necessary resources to fuel the next segment of your continuing exodus. 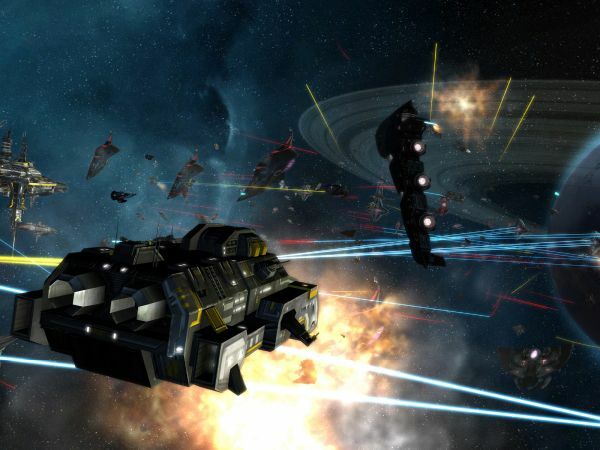 Visit the Official Sins of a Solar Empire homepage for more information. And now we come to the contest portion of our program. 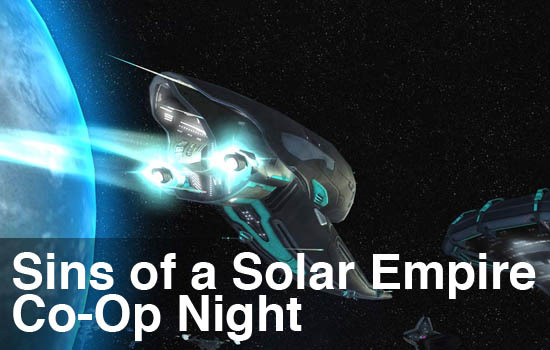 We're giving away 3 copies of Sins of the Solar Empire so you can join us for co-op night! Just leave a comment on this page and tell us what you'll name your capital ship! Or give us a link to the best looking Sins screenshot you can find. We'll draw winners this Friday, June 26th so you'll have all weekend to play!